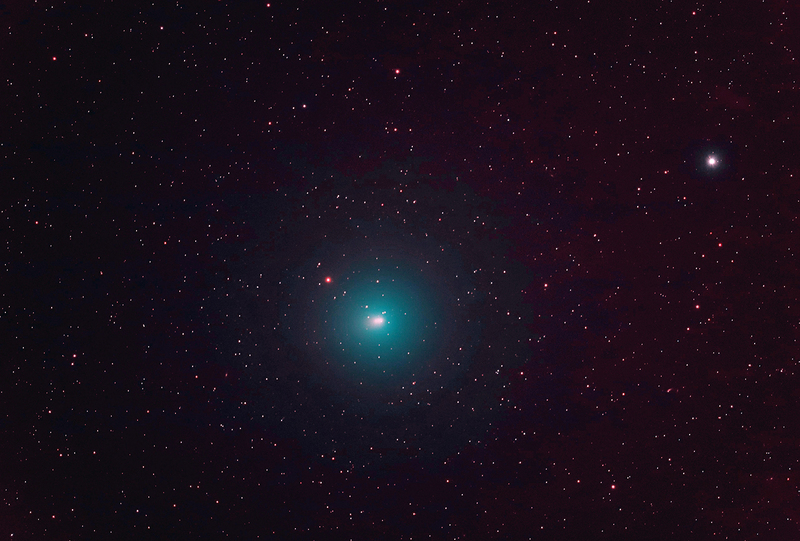 I got a latest comet image from Klaus Brasch, which was taken Dec/5th. Here is another image of Comet 46P/Wirtanen I obtained last night under much better sky transparency as well as reduced sky glow. The same TMB-92 f/5.5 refractor was used in combination with a Hutech modified Canon 6D Mark II camera and an IDAS LPS V4 filter. It really is a most impressive comet both in binoculars and through a telescope, since the coma is about as large as the full moon appears to the naked eye. No obvious tail was visible, however, nor prominent in my image other than a slight pink colored extension from the comet’s nucleus. Thanks for sharing, Klaus. I didn’t know the nucleus is as large full moon. This weekend looks good chance for me to see too. ~ by tedishikawa on December 6, 2018.